The Dynasty itself began with a series of four kings (in fact hardly more than nomarchs), who ruled from Thebes. Three known as Intef (or Inyotef), one - Mentuhotep. They were each involved in struggles against the northern kings of Herakleopolis. Interestingly, their Horus names indicate more their aspirations than reality: Intef II called himself 'Kings of Upper and Lower Egypt', whereas his control did not extend beyond the X nom of Upper Egypt; and Intef III gave himself the name Hr nxt nb-tp-nfr Horus Nekhetnebtepnefer (Beautiful and Strong Champion). The three Intefs were buried in great tombs in the Dra Abu el-Naga, on area to the north of the Theban plain on the west bank, close to where the road starts into the later Valley of the Kings. This theban nomarchs were, de facto, the most powerful vassals of hard-working Heracleopolitan Dynasties IX and X. After long-year rivalry with North they gained the rule over Egypt. 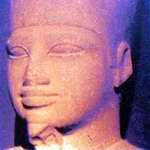 Mentuhotep Nebhephetre re-unified the land and established the rule, beginning the glorious period of the Middle Kingdom. Prince of Theban nome, founder of dynasty XI. In Royal List of Karnak mentioned as predecessor of Mentuhothep I. Frequently named Intef, son of Iku. Made wars with Herakleopolitan kingdom (X dynasty). He unified part of the Land (Thebes, Abydos, This) and extended Theban rule up to Dendera which means that to him were subjected nomes I-VI of Upper Egypt. The relief in the temple of Montu at Tod he is presented with Mentuhotep and Intefs II and III making offerings to the Montu. To Intef I belongs the earliest of the three tombs located in a row at the el-Tarif necropolis at Western Thebes, with pillar portico. Most outstanding ruler of this name. Aiming at unification of the Land he made wars with neighboring nomarchs – nome XIII (Asyut), XV (Hermopolis) and Herakleopolitan rulers - Cheti II and Merikare. Stela Hetepi of el-Kab and “The instructions for the king Merikare” mention battles of Thebans with Herakleopolitans. Finally Intef exptended his control over the land up the Antaeopolis nome X in Upper Egypt. Intef’s tomb is located at the el-Tarif necropolis in Western Thebes and is the middle of three portico tombs. Turin Canon gives 49 years of rule. Son of Intef II, father of Mentuhotep II. On relief in the Montu temple at Tod presented with his predecessors: Intef I and II and his successor – Mentuhotep II. Presumably put in order system of internal policy and expanded the borders as far as to nome XVII in Upper Egypt. The Turin Canon gives 8 years of rule. Burial place – third of the three tombs in-row at the necropolis el-Tarif in Western Thebes. sA-HtHr-nb(t)-iwnt mnT(w)-Htp(w) The Son Of Hathor, The Lady Of Dendara, Mentuhotep. The most outstanding of all rulers bearing this name and one of the greatest rulers of ancient Egypt. He was son of Intef III by queen Jah. Turin Canon gives 51 years of his rule. After long-lasting wars he finally defeated the Heracleopolitan kingdom and re-unified the land which took place somewhere between his 30 and 34 regnal years. He made war campaigns to Nubia and Libya. He warred against Bedouins of Sinai. The stone block from Deir el-Bahari records annexation of oases and Lower Nubia to Egypt. Stele of Henenu mentions revenge expedition against Bedouins and expedition to Libya for wood. Presumablu he renewed trade contacts with the land of Punt. In the Upper Egypt he erected many sanctuaries, among other magnificent mortuary temple at Deir el-Bahari which became his burial place and a splendid funerary complex. Between his funerary chamber and internal courtyard of the temple runs a 150 m long passage. The funerary chamber contained an alabaster chapel with wooden coffin of the king and funerary equipment. Of the royal mummy remained only fragments of skull. 1859 became a year of discovery of a tomb of queen Tem’s, the first royal wife. East-north of Mentuhotep’s sacral complex there is a tomb of Neferu, sister and second royal wife. It is supposed that Mentuhotep I, formerly identified by scholars with Nebhepetre, was predecessor of the Intefs on Theban throne and sometimes he is regarded as the founder of dynasty XI. 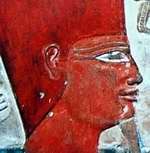 Son of Mentuhotep II Nebhepetre by queen Tem. He came to the throne after long-year reign of his father. At that time he himself was relatively elderly. During his reign he was preoccupied with raising and restoration of many buildings and with sending trade expeditions to the land of Punt. The first documented expedition took place in year 8 of Mentuhotep’s rule. With one of his harem women named Imi he had a son, Mentuhotep IV. However he is not mentioned by Turin Canon where dynasty XI ends up with Mentuhotep III to whom 12 regnal years are given. 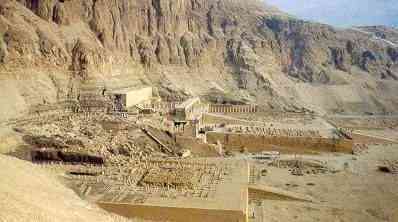 Burial place – Deir el-Bahari, where at the so called Mountain of Thot he erected a temple of Montu-Re. Also there he started to build mortuary temple modeled on his great father’s one, this work however remained unfinished. Son of Mentuhotep III by queen Imi. His name is recorded neither in Turin canon, nor royal lists. Instead, he is relatively well documented in rock inscriptions of Wadi el-Hudi and Wadi Hammamat. In his first regnal years he made expedition to quarries of Wadi el-Hudi headed by vizier Amenemes (Amenemhat). This might have been the Amenemhat I, founder of dynasty XII. This expedition, counting more than 10 000 men was to retrieve stone suitable for royal sarcophagus. Pretender to the throne, his name is recorded on rock inscriptions in nine Nubian cities. Name of this local ruler occurs only in rocky inscriptions near Umbarakab in Lower Nubia. According to J. von Beckerath the rule in Nubia was held simultaneously by three rulers: Intef Kakare, Iibkhenetre and Segerseni.